The Education Leadership Partnership (ELP) is seeking feedback on these recommendations and will summarize data collected through five (5) town hall events and this survey. A report will be submitted to the Board for consideration prior to making decisions on the recommendations at their November 2017 board meeting. While it is a goal to receive widespread feedback from all stakeholders, it is critical that we obtain the perspectives of those in clinical management/administrative positions who support clinical education efforts and hire/mentor new graduates. We need the help of CCCEs and Cis to raise awareness for those for whom these issues are not “on their radar” regularly. Please forward the link to your managers/practice owners with your own personal message to communicate the importance of their feedback on these issues. Consider watching the 20-minute video as a department to prepare for responding to the survey. 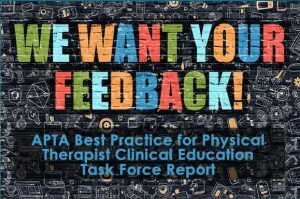 Read the Task Force’s Report or watch the narrated video overview, and review answers to frequently asked questions prior to beginning the survey. Allow ~15 minutes to complete the survey. Please feel free to leave a comment on our discussion board if you have any other questions or concerns you would like to share with the New England Consortium of Clinical Educators. 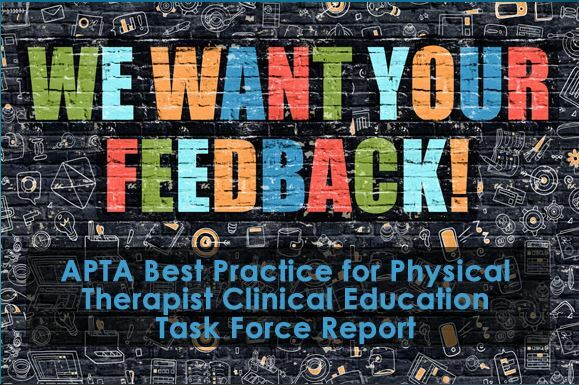 Thank you for partnering with us as we continue working towards a Shared Vision for PT Clinical Education.